The Green Ghost: Declassified has arrived! I have two solo short stories, and one cowritten with Eric Fein. Eric has several prose tales and two short comic stories. Spot & comic illustrations by David Niehaus. Limited edition cover art by David; trade edition cover art by Malcolm McClinton. Book design by Erik Enervold; published by Joe Gentile at Moonstone. Plus, a bonus tale, never-before-published, by the late Howard Hopkins. One of my solo tales is a sequel to Howard's story. 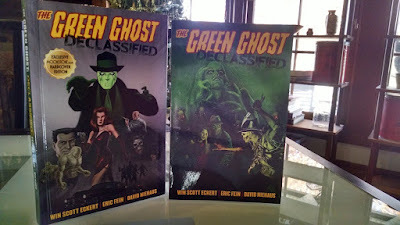 In the other, the Green Ghost teams with the Domino Lady against a very sinister, almost Rohmer-esque lady... And in my collaborative tale with Eric... Zombies! Under Broadway! !